Mankind, unable of healing death, misery, ignorance, and so they have decided not to think about them in order to be happy..
Pascal, in his thoughts, underlines that some adults in their full activity surrender to amusement: the number of urgent things that they have to do, make them not thinking about the essential question: what will I be after Death? This statement made a humorist say: Here rests a man, who never knew the reason why he lived. Life is something serious: during it we have to prepare our eternity. If we failed with this life, we will not have other opportunities, we could not try again, but we will have to answer for the space we left for love in our hearts and actions. So, it is about believing in an afterlife where there is, in the place where time and eternity gather, the Judgement. 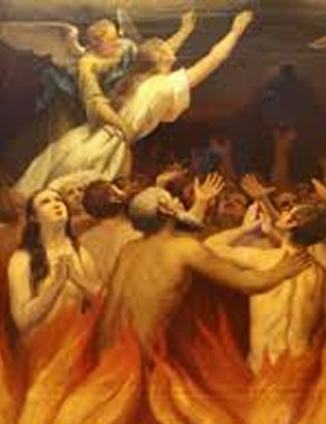 Purgatory, born by the infinite God’s mercy, it is necessary for the salvation of the souls; otherwise most of the souls were condemned to the eternal damnation. It is clear that mankind in order to achieve God’s intimacy must be pure. If this purification does not happen on hearth, it will happen put of time in love furnace. In here the soul should get purified in order to receive God’s embrace. Purgatory has been also a great resource of humanity. The idea that it is possible to redeem evil with good actions also for one’s own dead, it is brilliant: it deletes the impassable limit of death, it balances earth injustices and gives a positive power to all the actions. Following we could understand easier on which biblical basis the doctrine of the Church is built, which are and how last the punishments of Purgatory. There are also the illuminating words of the Holy Father John Paul II about the necessary purification in order to meet God. And then there are also the visions and the treatise of Saints, known by the Church, and some mystics. For some of them we added a short biography in order to understand deeply their spirituality. Saint Catherine from Genoa, Mary Simma, Saint Veronica Giuliani, Sister Faustina Kovalka, Saint Geltrude from Helfta, Saint Margherita Mary Alacoque and others will lead us through a fascinating world, which is waiting for us after death. But the first question we have to answer is: can we visit the souls in Purgatory.